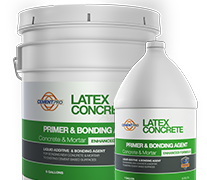 Is a high performance liquid additive / bonding agent formulated for bonding new concrete, mortar or cement based materials to existing cement based surfaces. Easy to apply, it avoids the need of roughing or scoring of old surfaces. This additive can be pre-mixed with equal amounts of water or used concentrated and achieve excellent performance. Can be applied to permanently bond new concrete, mortar or plaster to old concrete, mortar or plaster. It can be used in interior and exterior applications. Bonds new concrete, toppings, andPortland cement plaster or repair material to floors, walls, sidewalks, concrete pavements, curbs, and steps. Excellent additive when higher sheer bond strengths are necessary.